Global warming is the main growing concern all over the world. People are getting affected with various diseases with pollutants in the ambient air. Air pollution is one of the major killer in the world. Round the globe, millions of people are affected every day because of air pollution. Though scientists have raised their concerns through media, governments have taken various measure to minimise the pollution and even published Air quality standards, nothing is getting changed much rapidly. Its we people who needs to realise and start taking measures to lead life happily. Well all said, we come to the actual topic. I was actually looking around for a device which can monitor air pollution in a room and provide feed back. I came across "Air Mento Pro" which I found quite interesting. This product is a 6-in-1 indoor air quality monitor. 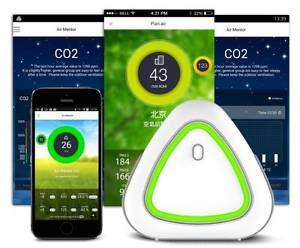 It has the capability to detect concentrations of CO2 (carbon dioxide) , VOC (Volatile Organic Compounds) together with CO (carbon dioxide), PM2.5(Fine particles ), PM10, temperature and relative humidity. If you are doing yoga in a closed room, its very important to have fresh and clean air around. This product design style fits the yoga environment. The combination of LED light shows the corresponding level of air quality with different colours. There is even a smart phone app that provides explanations of the numbers and changes. The cloud computing infrastructure analyses the air quality patterns and gives effective advice to users. Coming to mobility wise, its designed with a in-built rechargeable battery which allows you to carry anywhere for temporary use. With the Air Mentor, people can be aware of the air quality around them, in order to ensure a healthy life. This product is recognized with the COMPUTEX d&i awards 2015. Hope world will be back track again with less air pollution and people lead a peaceful and healthy life. 3D Printed cars will be our future ?